Larry Householder, Speaker of the Ohio House of Representatives, center, speaks at Friday’s Republican Luncheon. 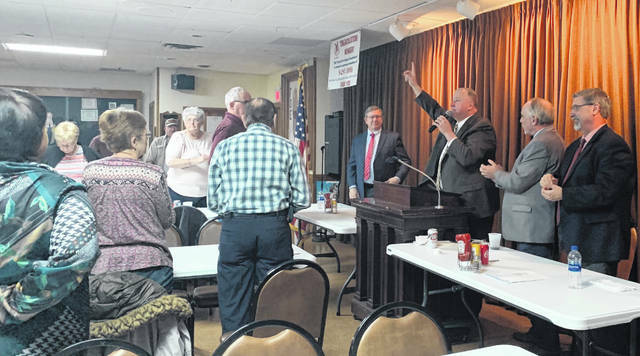 Larry Householder, Speaker of the Ohio House of Representatives, center, urges the room to stand in support of President Donald Trump at Friday’s Republican Luncheon. 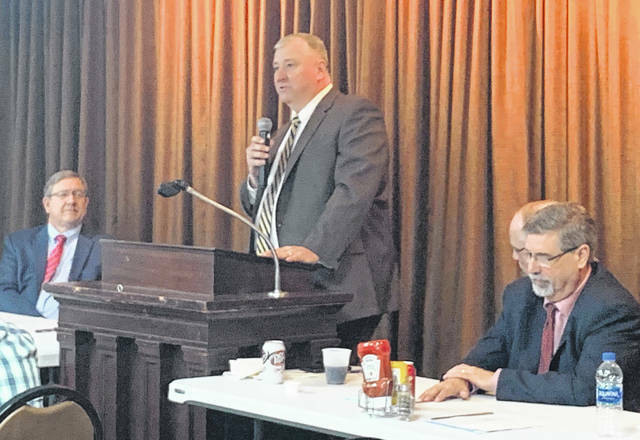 LIMA — Larry Householder, Speaker of the Ohio House of Representatives, threw his support behind the recent gas tax increase and proposed school funding reform at the Allen County Republican Luncheon Friday. Alongside Householder at the meeting were State Rep. Bob Cupp and Ohio State Sen. Rob McColley. Householder commended Cupp on continuing the efforts of school funding. Householder also shared that through conversations with Gov. Mike DeWine, he knew DeWine didn’t want to have to increase the gas tax, but he thought it is what is needed. “Our road systems are changing, and our cars are changing and they’ve become more fuel efficient,” Householder said. “That’s part of the reason we are running out of revenue is because cars are becoming more fuel efficient and we’ve been flat funded as far as revenue for the last 15 years, but our costs have continued to escalate because of inflation. Reach Tara Jones at 567-242-0511.